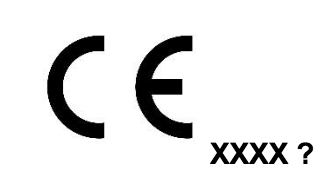 Does Your CE Mark Need a 4 Digit #? A 4 digit number next to or underneath a CE mark is a “Notified Body” (NB) number. This number is traceable to the Notified Body that approved the CE mark on the product. All products under the CE Low Voltage Directive are “self-declaration” and do not involve a Notified Body. Under the CE Machinery Directive, only products listed in Annex IV must be Notified Body approved. For medical products, Class I non-sterile medical products that do not involve a measuring function do not require a Notified Body. However, all other medical products must have their CE mark issued by a NB. The CE Pressure Equipment Directive includes pressure vs. volume tables that define the hazard level above which requires a Notified Body. A large percentage of products fall under CE Directives that do not involve a Notified Body. These products bear only the CE mark, with no adjacent 4 digit number. However, products that present a higher risk are typically required to have a Notified Body verify product compliance and approve use of the CE Mark. For these products, a four digit number that identifies the specific Notified Body must be located below or to the right of the CE Mark. In those cases, the Notified Body provides the CE artwork with their Notified Body number. CertifiGroup is the only lab in the world that works with all CE Directives!